Caustic soda smeared across the cabinet and with the kettle boiling, I make a cup of tea and wait for it to do its magic on the varnished surfaces. The time allows me to reflect on current projects, and mentally create a "to do" list, of which I keep to, for all of 2 days, then it goes out of the window as my day job and household diy projects zap me of energy and enthusiasm. 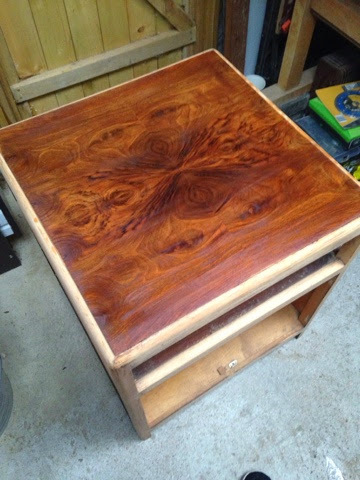 Returning to the cabinet, I see no change in the varnished finish. It is as though I have put a bit of water down on it and gone and put my feet up! Frustrated, I grab the heat gun and go to town. This has some results.... but results are slow! So I grab an old plane blade and create a burr to use as a cabinet scraper. I should have started with this! I get to bare wood in seconds, and despite accidentally going through the veneer at the edges, it looks beautiful after a little varnish. I will need to find a way to hide those edges, but for now.... onto the next project! 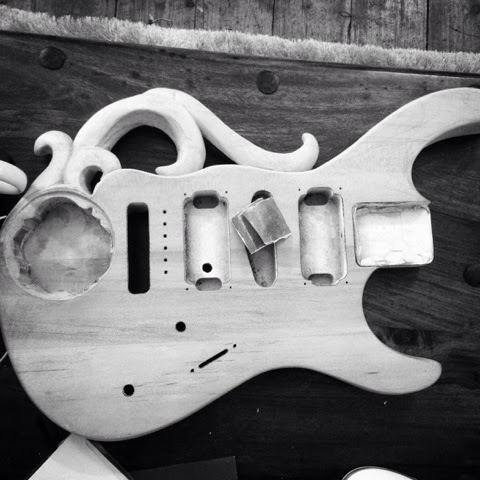 I left this guitar for too long.... How on earth was I planning to embed this battery compartment?! Who needs flashing lights in a guitar anyway? Let's get this baby finished! 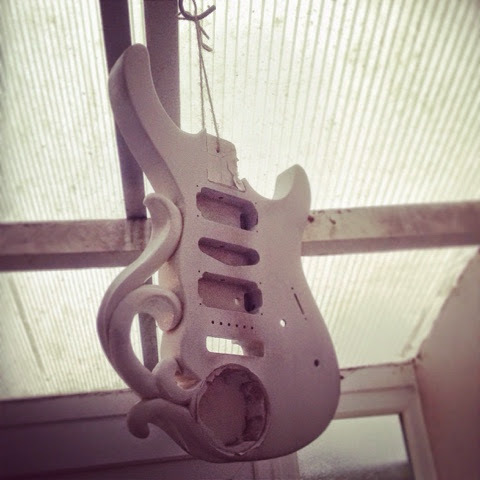 Note to others: Don't wear your best trainers while spray priming your guitar. They don't look quite as good by the end! Trainers ruined and guitar hanging dangerously at head height in my lean to, I get the urge just to do a simple carving. It's nearly Remembrance Sunday. 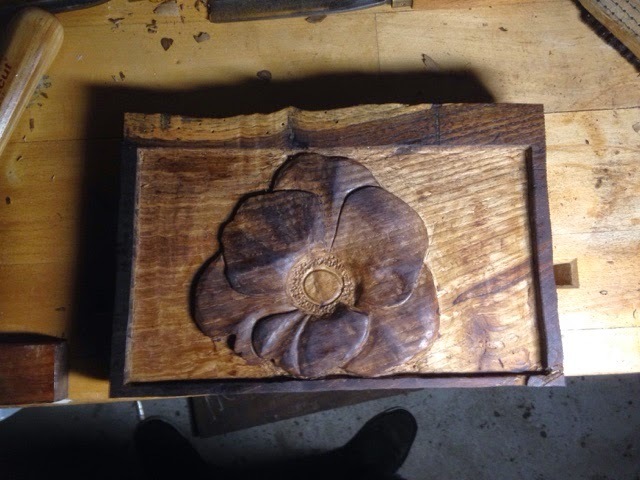 So what better way to pay tribute to those who have, and are, fighting for us, than to carve a poppy from an old pine board from a cabinet that was around in the Great War. 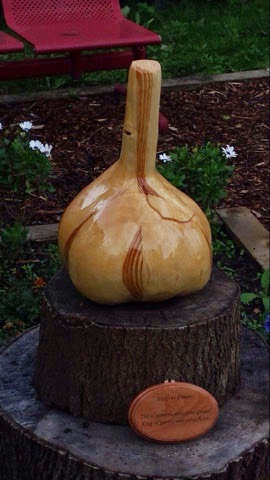 To watch me carve it follow the link! Ok that's it for this week, please comment, like and share. 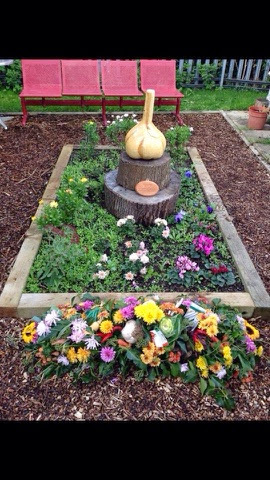 A quick thankyou to my last client who's made the process amazingly fulfilling and has even sent me photos of the garlic memorial carvings new home!